Freezing is one of the most effective and efficient ways of storing essentials or ready-made foods for quick and easy dinners. These days most families have either a freezer or a freezer compartment within their fridge but how many really know how to get the best out of it? Read our top tips to see how well you’re doing. Freezing food is a way of preserving it – so you want to make sure you preserve it at its best – and that means at its freshest. If you are freezing something bought from a supermarket, remember to do so as soon as your reach home to stop any deterioration in quality. It is essential that the freezer is kept at an optimum temperature – that is, 0°C/-18°F or below. This is because at freezing point, bacteria are prevented from multiplying. As soon as food starts thawing, the deterioration process will continue where it left off. If you are freezing vegetables, always blanch them first to stop further decay or discolouration during the freezing process. As a general rule of thumb, the higher the water content of the fruit or vegetable, the less well they freeze – although some freeze more successfully if cooked first. 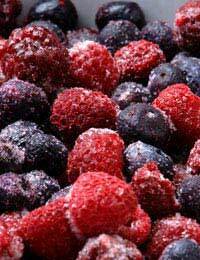 If you are freezing fruit with stones, such as apricots or damsons, try to remove the stones first. If not, an almond flavour can develop caused by the kernel. The only exception to this might be plums, when the stones can actually help pectin levels to be maintained – useful if you are intending to make jam. Buy or pick lots of soft fruit whilst they are in season and still relatively inexpensive in the summer, then store in small mixed bags and you have the makings of an instant smoothie, fruit pie or vitamin booster drink for those darker winter nights. When cooking a family meal such as lasagne, shepherd’s pie, fish pie or casserole, cook double the quantities and freeze one batch for another day. This not only uses your oven more efficiently but provides a good wholesome meal when time is tight or the cupboard is bare. You could also divide the surplus into smaller portions for when children might need feeding separately from the rest of the family. A freezer is perfect for keeping essential staples at hand. Milk, butter, bread and cheese all freeze well and will save many a dash to the corner shop to pick up spares when you run out. The only thing to watch our for is that after a couple of months, cheese can tend to crumble in the freezer. An alternative is to grate it first and then store ready-to-use in bags. If you are super short of time or just hate making the packed lunches, then provided the right ingredients are chosen, sandwiches and filled rolls can be frozen too! Don’t include salad or egg (as it goes black) but hard or cream cheese, pate, marmite, chicken, etc can all be used. Also pies, pasties and cooked sausage rolls are perfect items for the freezer – just make sure they are thoroughly de-frosted before being eaten. Similarly, individual muffins or slices of cake can be frozen separately and taken out as needed, preventing it drying out. If using your freezer well, remember to date and label the products as you store them and use them within a reasonable amount of time.